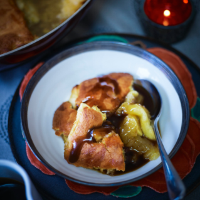 Eve’s pudding is syrupy stewed apples topped with fluffy sponge. It’s delicious with toffee sauce – leave out the rum if you’re serving it to kids. a medium heat for 15 minutes until starting to soften. Remove and discard the cloves; tip the apples and any liquid into the dish. 2. Using electric beaters, beat the butter for 2 minutes until pale and fluffy, then beat in the remaining 100g caster sugar. Beat in the eggs, then the milk, flour, a pinch of salt and the remaining lemon zest. Pour this mixture over the apples, spreading evenly. Bake in the oven for 25–30 minutes. 3. Meanwhile, make the toffee sauce. Put the rum, butter, sugar and a pinch of salt in a saucepan and melt over a medium heat. Whisk in the cream, simmer for 2 minutes, then allow the sauce to cool slightly before serving with the pudding.